Thank you! We liked so much, we are ordering 2 more of the same! I placed an order for the Personal Lifesaver Ring and actually received it the very next day!. It is absolutely perfect! We ordered for a co-worker who is retiring and plans on spending much of his time on his pontoon boat with his grandchildren. Our office staff plan to sign the back and write well wishes as a momento. I know he will love it! It will be perfect for use on the boat but cool enough to hang on the wall at the cottage when not in use. Extremely happy with the product and service! This was quite the wonderful surprise. We bought this in the summer and we were not sure what to think. We needed a buoy for the boat and figured "hey let's just get a personalized one." We definitely made the right call on this. Not only do we have the buoy on the boat it makes for a nice decoration. It took no time to get it. I think a few days. I will be back to find more products for our boat. I was so happy when I got this life buoy. It really makes my boat. People are always commenting on where did you get it and I always tell them. The color is awesome I picked the Blue - 005 looked just like the picture. Bought my life ring just about a year ago. Man was I impressed. It looks absolutely beautiful. It goes nicely with my pontoon. I was concerned about how well the letters would adhere. There is no need for concern. It’s almost as if they’re painted on. They called it “pressure applied‘. My choice was between a “decorative” ring for $60, or this ring. This ring was without doubt the right choice. Top quality and Coast Guard approved. We proudly display the ring on our boat and it looks great. I recommend this ring without reservation. I just rec'd my personalized life ring and it is awesome! The product is of very good quality and the service was fast and efficient. I look forward to ordering from you in the future. Thank you SS Nautical! 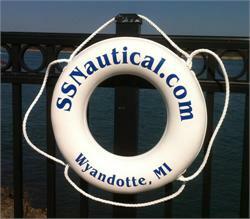 We ordered a personalized life preserver for my daughter's wedding to utilize as a guest sign in. It was absolutely adorable. All of the guests left their autograph along with a nice message of good luck and love. My daughter and son-in-law plan to keep it forever on their boat! Personalized life rings continue to be one of our largest selling products. 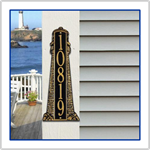 This product is Coast Guard Approved and will resist fading in the sunlight for years to come. These are displayed in backyard pools, on large and small boats, and large resorts around the country. This is a great gift idea for your Nautical friend or family member.